Some commentators recently expressed outraged that governments spend money on cycling improvements. Examples include Christopher Cadwell’s Drivers Get Rolled: Bicyclists Are Making Unreasonable Claims To The Road—And Winning, in the Weekly Standard, and Bob Poole’s A U.S. Bicycle Route System? in Surface Transportation Innovations #121. You could call them cycling critics, because they assume that bicyclists have inferior rights to use public roads and that cycling facility investments are wasteful and unfair, or call them automobile dependency advocates because their general message is that transportation planning should focus on facilitating automobile travel with little consideration for other modes. Their arguments are largely wrong, I’ll call them "half-truths" to be charitable, presented with great certitude and self-righteous anger. These articles are published in ideologically-oriented periodicals for readers who share their prejudices, so they make little effort to justify their positions. However, it is important that people involved in multi-modal transport planning understand these issues because they often surface in policy debates. I evaluate their arguments below. I consider walking and cycling together, called active or non-motorized transportation, since their planning often overlaps: separated paths, complete streets policies, and urban traffic speed reductions support both. These issues are discussed in more detail in my report Whose Roads? Evaluating Bicyclists’ and Pedestrians’ Right to Use Public Roadways, and you'll find more detailed information on their economic analysis in the report Evaluating Active Transport Benefits and Costs. Critics claim that walking and cycling are unimportant, based on data indicating that about 90% of households own automobiles and 95% of all commute trips are by motorized modes. However, active transport is more important and more common than such statistics indicate. Active modes play unique and important roles in an efficient and equitable transport system. They provide basic mobility, affordable transport, access to motorized modes, physical fitness, and enjoyment. Just as it would be inefficient to force travelers to walk or bike for trips most efficiently made by motorized modes, it is inefficient and unfair to force travelers to drive for trips most efficiently made by active modes, for example, if children must be chauffeured to local destinations because their communities lack sidewalks, or if people must drive to recreational trails due to inadequate sidewalks and paths near their homes. Improving walking and cycling conditions benefits users directly, and benefits society overall, including people who do not currently use walking and cycling facilities, by reducing traffic and parking congestion, accident risk, pollution emissions, chauffeuring burdens and health problems. Conventional statistics tend to underreport active travel because most travel surveys undercount shorter trips (those within a traffic analysis zone), off-peak trips, non-work trips, travel by children, and recreational travel. Surveys often ignore active links of motor vehicle trips, for example, a bike-transit-walk trip is classified simply as a transit trip, and a motorist who walks several blocks from a parked car to a destination is classified as an auto user, the walking and cycling links are ignored. Statistics often reflect only adult commute modes, although walking and cycling mode shares are much higher for other types of trips, such as school commuting, local errands and socializing. More comprehensive surveys indicate that active travel is two to four times more common than conventional surveys indicate, so if statistics indicate that only 5% of trips are by active modes, the actual amount is probably 10-20%. According to the 2009 U.S. National Household Travel Survey, 11% of personal trips are by walking and 1.0% by cycling, and for the 27% of trips less than a mile, 31% are by walking and cycling. Only about 5% of walking and cycling trips are for commuting, and about half are purely recreational, so for each active commute trip there are about nine other utilitarian active trips, and about ten recreational trips. Planning should reflect potential demands. Optimal investments in a mode should be based on the level of use that would occur once the improvements are completed, including currently latent demand. For example, a corridor might currently have 5% bicycle mode share, but if improvements would increase this to 10% the investment should be evaluated based on this higher value. Critics sometimes argue that walking and cycling primarily provide recreational travel, with the implication that this frivolous. For example, Poole asks, “Why should I—either as a highway user-tax payer or a general taxpayer—have to pay for someone else’s hobby?” But a significant portion of all travel is recreational: travel for vacations, to sport and cultural events, or to shop for recreational goods. Critics assume that automobile trips that serve recreational purposes are important but walking and bicycling trips that serve the same purposes are not. For example, they value a car carrying passengers to walk or ride on a trail, or to a gym to pedal a stationary bike, but not people who walk or bike directly from their home. This is arbitrary, inefficient and unfair, reflecting a bias against non-motorized travel. A commonly assumed half-truth is that, because various vehicle fees (fuel and tire taxes, and registration fees) are dedicated to roadways, motorists pay for roads. This is generally true for major highways, but most local roads -- the roads that pedestrians and cyclists use most -- and an increasing portion of regional highways, are funded by local property and sales taxes which residents pay regardless of how much they drive. Currently, only about half of total U.S. roadway expenditures are financed by motor vehicle user fees, a portion that is declining, a indicated below. The portion of total roadway expenditures financed by motor vehicle fees is declining. For example, in 2011, highway user fees totaled $127 billion, while $206 billion ($665 per capita) was spent on roadways, leaving $79 billion ($255 per capita) in general taxes spent on roadways. Because pedestrians and cyclists are small and light they impose lower facility costs per mile traveled, and they tend to travel fewer annual miles than motorists. As a result, people who drive less than average tend to subsidize the roadway costs of people who drive more than average. Let’s put this into perspective. Portland, Oregon’s 40-year bicycle plan, considered one of the most comprehensive in the U.S., is projected to cost $138-605 million, which sounds like a lot of money, but averages just $3.5 to $15 million annually, or $6 to $25 annually per capita, a small fraction of the approximately $665 per capita spent annually on roadways. This suggests that in most communities only 1-2% of total transportation funds are devoted to walking and cycling facilities, far less than their mode shares. To be fair, Poole could argue that his criticism only applies to the Interstate Highway system which is largely funded by motorist user fees. However, if critics are to claim that it is unfair for cyclists to use motorist-funded Interstate Highways, they should be equally vocal in advocating that motorists pay more when using local streets and regional roads. What is he talking about? Pedestrians and cyclists do not require a quarter or a third of total road space. A typical urban arterial has a 60 foot width right-of-way. A typical bike lane is 3-4.5 feet wide, so two lanes require 10-15% of total width, and bike lanes are only required on a minority of total roadways, such as urban arterials. Although I have found no cost estimate for the 50,000-mile US Bicycle Route System, it is likely to be modest. Most intercity cycling routes consist primarily of signs and maps, modest road shoulder improvements which are also justified for motorist safety and roadway durability, and some special paths and bridge improvements on links where cycling is currently difficult, dangerous or impossible. Their incremental costs are a tiny portion of total roadway costs. As previously mentioned, Portland’s bicycle program costs $6 to $25 annual per capita. Similarly, the U.S. Nonmotorized Transportation Pilot Project spent about $100 million in four communities with about 860,000 total residents, or about $12 annual per capita if depreciated over a decade. After just four years this program increased walking 22% and cycling 49%. This suggests that relatively aggressive pedestrian and cycling improvement programs only cost about 1-4% of the total per capita roadway expenditures, or just 4-10% of general taxes (taxes that all residents pay) spent on local roadways. Since walking and cycling represent about 12% of total trips, and a much larger share of short urban trips, and since most North American communities have underinvested in walking and cycling facilities for the last half-century (many neighborhood streets have no sidewalks, and many arterials lack bikelanes), much larger investments in walking and cycling facilities can be justified to meet user demands (to insure that people can walk and bicycle where they want) and for fairness sake (to insure that non-drivers have adequate mobility options). Critics assume that sidewalks and paths are required to serve pedestrians and cyclists but it is equally appropriate to say that they are required to reduce risks imposed by motorists and reduce motorists’ delay, since motorized and non-motorized modes can safely share roadways provided that motorists drive slowly and yield as required. The problem is that motorists are often unwilling to do this. Sidewalks, bike lanes and separated paths are needed to allow motorists to drive faster. If we assume that all travelers have an equal right to use public roadways than it is appropriate that motorists bear some or all costs of special facilities. Cadwell bases much of his criticism on the assumption that cyclists are affluent, indulgent and selfish Baby Boomers, insensitive to the more important needs of working class Americans. This is inaccurate and unfair. Certainly, some cyclists reflect that profile, an increasing number of adults bicycle, but travel data indicate that bicycling occurs about equally among all income groups, with the highest rate, 1.3%, in the $20,000 to $40,000 range, 0.9% in the $75,000 to $99,000 range, and 1.1% for all other groups. There are certainly many lower-income people who rely on walking and cycling for basic transportation, and many more who could benefit from active transportation investments. Cycling facility improvements tend to attract more vulnerable cyclists: youths, women and seniors who could benefit significantly from healthy and affordable modes but are currently deterred by the hazards of cycling on roadways. Improving walking and cycling conditions can help reduce traffic congestion, both directly and in conjunction with public transportation. For example, a recent study found that Safe Routes To Schools programs can achieve up to 20-point mode shifts from automobile to active modes, for example, reducing peak-period vehicle trips from 300 to 200 at a 500 student school. Or consider a typical commercial arterial strip where shoppers must drive even short distances from one store to another, due to inadequate sidewalks, crosswalks and bike paths. 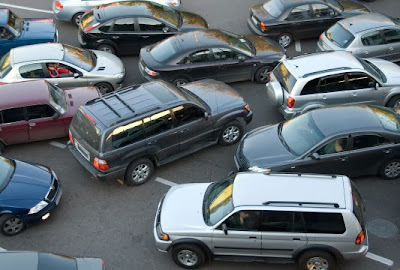 Such maneuvers, exiting and entering parking lots, cause traffic friction, contributing to congestion and accident risk. Improving walking and cycling facilities can reduce congestion delays, benefitting both local and longer-distance vehicle users. In automobile-dependent communities motorists are often forced to spend considerable amounts of time chauffeuring non-driving family members and friends, a burden that can be significantly reduced with pedestrian and cycling improvements. Total traffic accident risk, including for motorists, tend to decline as walking and cycling activity increase in a community, an effect called safety in numbers. So, what is the optimal level of investment in walking and cycling? Let me share some general thoughts which I’ll explore in more detail in a future column. It is important to recognize the unique and important roles that active modes play in an efficient and equitable transportation system, and the various benefits that can result when walking and cycling are improved, including indirect benefits to people who do not currently use those modes. It is therefore efficient and fair to invest in facilities that serve the demand for these modes, including latent demand. Although in North America only about 10% of total trips are by walking and 2% by cycling, communities that invest in appropriate facilities have much higher rates. For example, Portland’s bicycle commute mode share increased from 1.1% in 1990 to 6.8% in 2011, and here in Victoria, BC we have about 6% bicycle commute mode share, numbers which underestimate true cycling demand since bicycling tends to reflect much larger portions of errand and social trips than commute trips (a 5% bicycle commute mode share probably reflects 10% mode share of total trips, including travel by children and recreational travel, that tends to be undercounted in conventional travel surveys). This suggests that in most North American communities cycling demand (the mode share that would result after communities implement cost-effective improvements) is 5-15%. Communities should be willing to invest at least this portion of total transportation resources, money and road space, into cycling improvements, and sometimes more to make up for past underinvestment. Similar or even greater investments can be justified for pedestrian improvements. Another approach is to recognize that in a typical community, 20-40% of residents cannot or should not drive due to age, disability, low income, or other constraints. Although they tend to have relatively low travel demands since some are unemployed or retired, they still have legitimate travel needs. Social equity suggests that much of the taxes they pay toward local transportation facilities and services should be devoted to non-automobile modes. Described differently, most of the approximately $250 that non-drivers contribute in general taxes toward local transportation facilities should be spent primarily on walking, cycling and public transit, so they receive a fair share of benefits. It is also possible to perform benefit/cost analysis to determine the cost efficiency of specific pedestrian and cycling improvements. Several researchers have done this (Gotschi 2011; Guo and Gandavarapu 2010; Grabow, Hahn and Whited 2010), although they tend to focus on health benefits and overlook other important transportation benefits such as congestion reductions, parking cost savings and consumer vehicle cost savings, and so undervalue these investments. Critics arguments that pedestrians and cyclists receive an excessive share of roadway resources is more evidence that automobile travel makes people selfish. Automobile travel requires expensive facilities and large amounts of energy, imposes significant risks on other travelers, and causes significant air and noise pollution, yet motorists only see the costs they bear, ignoring the costs they impose on others.